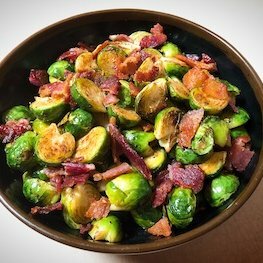 Brussels sprouts and bacon. Easy, healthy, and super keto-friendly. I would like to say more about the recipe... but I got nothing. I was told it was good, but I honestly can’t remember because I didn’t taste much of anything while I ate the evening I made it. This was the dish I was making for dinner the day we went to pick up our cat from the vet only to discover that that would never come to pass. We went home with heavy hearts having said our goodbyes and put an end to our beloved pet’s suffering. Wash, trim, and cut brussels sprouts in half. Microwave on high for 5 minutes or until softened, stirring once halfway through. 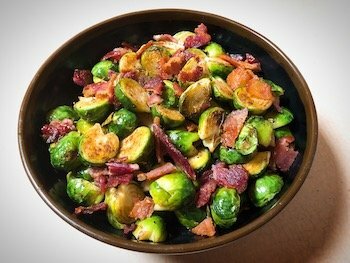 While the brussels sprouts are softening in the microwave, fry bacon in a cast iron skillet until crispy. Remove bacon from pan and allow to drain on a paper towel. Chop into chunky pieces and set aside. Remove bacon grease from skillet, saving 1 tablespoon. Add butter and 1 tablespoon bacon grease together in the cast iron skillet and melt over and medium heat. Stir in garlic and cook for 1 minute, or until softened. Add Brussels sprouts to skillet, placing them face down and cook for 2-3 minutes or until browned with a few blackened areas at the edges. (*You can, of course, skip in placing them face down and just toss them in, but it does give them a more appealing charred look and taste.) Give them a stir to flip/redistribute them and cook another 2-3 minutes. Add balsamic vinegar to the skillet and use a firm plastic spatula or wooden spoon to deglaze the pan. Remove from heat and stir in salt and pepper to taste and sprinkle with bacon chunks before serving. If you make this recipe, let me know how it goes. As always, if you post any pics of your creation on Instagram, tag me so I can see your creation.